The festival of Chitra pournami or poornima is celebrated on the full moon day of the month of Chitra (April - May). It commemorates Chitragupta who according to scriptures assists Lord Yama, the God of Death. 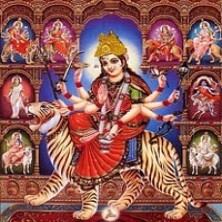 This day is considered auspicious in all Shakthi temples and hence is celebrated with much fervor. There is a legend associated with Chitra Poornima involving Lord Indra, the king of Gods, and his Guru Brihaspati. Lord Indra and Brihaspati once had an argument. As Indra failed to respect Guru, he stopped advising Indra who started committing sins in the absence of Guru. Days passed and Brihaspathi returned to his duty. He advised Indra for a pilgrimage to the earth to lessen the burden of sins. During the pilgrimage, Indra realized that he had been redeemed from the sins. He found a Shiva lingam under a Kadamba tree and believed that Lord Shiva had helped him in relieving his sins. Following this, he started worshiping him. He worshiped Lord Shiva with a golden lotus which he found from a nearby pond. This was believed to be happened on a Chitra Pournami day and the place was Madurai in South India. Chitra Pournami is considered an auspicious day for worship at all Devi/Shakthi Temples. The Shakthi Homam (for Durga, Lakshmi and Saraswathy) will be performed at the Thiruveethiamman Temple in Chennai. Chitra Pournami is considered an auspicious day for worship at all Devi/Shakthi Temples.